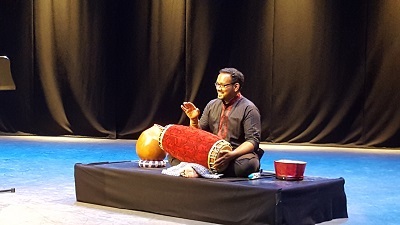 A NEW opera blending ancient Indian mythology, the music of one of the greatest classical Indian musicians of our age – and deploying some of the finest operatic, dramatic, dancing and musical talents in the UK, was unveiled yesterday. “Sukanya” is a new opera conceived by the iconic Ravi Shankar – once described as ‘the most famous Indian’ in the 1960s when he was hanging out with The Beatles and other major cultural figures of the time. Ravi Shankar enjoyed a long career playing the sitar around the world and is widely credited as being the first musician to popularise classical Indian music in the West. He died in December 2012 in hospital, near his home in California, aged 92. “Sukhanya” was an opera he was working on right up until his death and has now been completed by his friend and long-time collaborator, conductor David Murphy – with help from Shankar’s daughter, Anoushka, who is a well-established sitar player in her own right. “Sukanya”, the opera will premiere at The Curve in Leicester on May 12 2017 and will enjoy a short tour, culminating in a final performance of four at the Royal Festival Hall in London’s Southbank on May 19. Taking a classic ancient tale, it will feature the London Royal Philharmonic Orchestra, Indian Kathak dancing, opera singers Susanna Hurrell, Keel Watson and Michael de Souza, the BBC singers and a US-Tony award winning stage design company. It will be directed by Suba Das, The Curve’s associate director and the dancers will be choreographed by Aakash Odedra Company. It has been financially supported by the charitable Bagri Foundation and Arts Council England. The idea came to Ravi Shankar not long after he met the mother-in-law-of his wife, who carries the name ‘Sukanya’ and discussed its origins. The name comes from an ancient tale in the Sanskrit/Hindu text, “The Mahabharata” and is about a young princess who is betrothed to an ancient blind sage, and is devoted to him – much to the displeasure of two gods who decide to intervene with terrible consequences. Widow Sukanya Shankar and daughter Anoushka, both appeared yesterday at the Royal Opera House (ROH) to unveil the project that is “Sukanya” . Serious work on “Sukanya” had started in 2010 shortly after the world premiere of Ravi Shankar’s first ever Symphony at the Royal Festival Hall with the London Philharmonic Orchestra, conducted by Murphy. He worked with Ravi Shankar on the debut opera and was able to take it through to completion after the great musician’s passing, with help from Anoushka and his own instincts – knowing the man as he did. Murphy told www.asianculturevulture.com that his dear friend Ravi Shankar had first mentioned it to him in 2004 and it had taken real shape more latterly. Even when Shankar was in hospital in 2012, Murphy was in touch with Shankar about “Sukanya”. He said he had looked to go back to the heart of both the operatic and Indian classical music traditions. He said he had started with a raga – a harmony in Indian classical music and developed it from there. In a one-to-one, Anoushka told www.asianculturevulture.com her father had been committed to creating an opera mixing both western and eastern musical elements. “He talked to us about it as family and as a musician, it was very key for him,” Anoushka said. 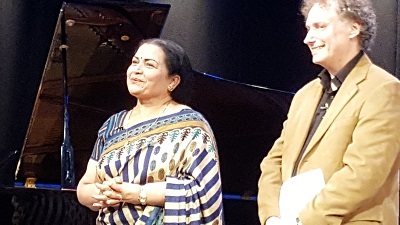 She added: “My father was, of course, the first Indian classical musician to work with Western classical musicians, the first to write concertos for orchestra, the first to bring the music of India to a global audience. Sukanya told www.asianculturevulture.com her husband had not talked explicitly about the project with her. The insinuation is that he kept it from her because it was an act of dedication and a personal gift from a loving husband to a dear wife – and therefore, a surprise. “He was such a romantic man and extremely romantic person,” Sukanya concurred. “I am really looking forward to this – it’s so unique, nothing like this has happened before – I don’t anything like this might (ever) happen again. I am so grateful to everyone, to all these vehicles, making it possible. “Somebody asked me whether I miss him, I said: ‘No. He is still with me, within me’. Anoushka whose voice quivered with emotion in her introductory remarks, said her father was always keen to dismantle musical conventions and create new openings and that her input had been a labour of love. In her one to one, she added: “It is emotional but it’s a way of reconnecting with him and reconnecting with him through the music. “It will be challenging because of the scale of collaboration across cultures that hasn’t happened before – all these different elements of East and West and (practically) every medium of art – it will be challenging for everyone. “The toughest part might be when we come to put all the elements together but it’s tough in a good way. Director Suba Das said the biggest challenge was the scale of the production – with some 100 people involved and felt his experience of Shakespeare would stand him in good stead. 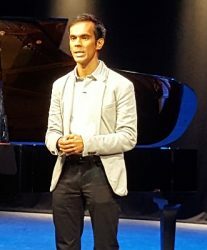 Described as a semi-staged opera, “Sukanya” features a libretto (literally text) by the well-known novelist and musician Amit Chaudhuri, and a 60-strong London Philharmonic Orchestra set, and will be supplemented by Indian musicians on traditional instruments including the sitar, shennai, tabla, mridangam, and ghatam. 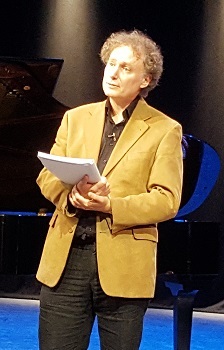 John Fulljames, associate director of ROH opera, said: “Opera is the perfect art-form for Ravi Shankar whose vision embraced text, image and dance as well as music. His work on this new opera with Amit Chaudhuri and David Murphy has deep roots in the literature and the classical music of both Europe and India. “Sukanya” is a co-production between The Royal Opera, London Philharmonic Orchestra and Curve and the final performance is presented in association with Southbank Centre. Awesome web site you’ve got going here. Check beneath, are some entirely unrelated internet sites to ours, however, they are most trustworthy sources that we use. bnxqhummxca,Waw! Its really great and wonderful ever i found. Thank you for sharing this info.